We want our systems to speak in many voices. We want to understand what the music is about and to hear how it is being played and recorded, regardless of its genre or specific character. The enormously complex relationships between the instruments, the expression, phrasing, and interpretation of all the musicians and the way that the producer has understood those things and bought them to our ears is absolutely vital to me. So, yes, we tend to want it all from the powerful transient of a bass drum or the slap of an electric bass guitar to the merest harmonic whisper of a delicately stroked piano. But, as well as that, surely we need to feel some sort of emotional connection to the whole experience and this is always a harder area to quantify. It remains one of audio’s great imponderables as it covers so many areas. I have always loved the art, technique, and spirit of great musicians and if by chance their works find themselves translated into a great recording then you can find yourself in the company of greatness. What better ground for a wonderful audio system to exploit? Listening is half the pleasure, hearing is another. Are you interested, like me, in the emotional impact of music? Surely it is a language we are talking about here and that is a weighty subject without end. Ultimately it comes down to the simplest of things really. You either love a system and feel a connection to it or you don’t, and this obviously depends on how much you enjoy listening to it. But, there is no sliding scale or points scoring table to refer to when contemplating this, one way or another. Sure, taste and life experience come into it of course, but there is also intrigue, fascination, mood, location, and the pure desire to listen as well. Music is both simple, nourishing, and endlessly complex at the same time. But it has a mood, a message, and an atmosphere too. Assuming some kind of steady-state level of reception from any of us is implausible. We are a part of the whole experience every time we listen. When the Estelon YBs arrived and we were unpacking them, I was thinking about my all-too-brief time with the Extreme, Estelon’s appropriately named and priced flagship model, in a very sympathetically damped listening room in London’s West-End. Various people were milling around and different music was being played while Hi-Fi+ Editor Alan Sircom and I chatted quietly in a huddle at the back of the room. Suddenly some choral music soared above the muted crowd noise. Its ethereal, hugely ambient scale captured and owned the room. The sense of a natural acoustic and the way the system recreated the recording space stopped everyone in their tracks. It was like being in a church with hard, towering walls and long, long reverberation times. The whole spirituality of the choir and their performance was so beautiful and so incredibly powerful that it shocked me into an almost reverential silence. There was something happening that day, in that room, with that system that everybody shared. It was like being in the presence of a significant event and it has stayed with me ever since as a reminder of how powerful and important a great system can be. I still don’t know what piece was being played or who brought it along and that’s fine. It doesn’t diminish the experience though, but emotionally it was incredibly heartening and extraordinarily potent. 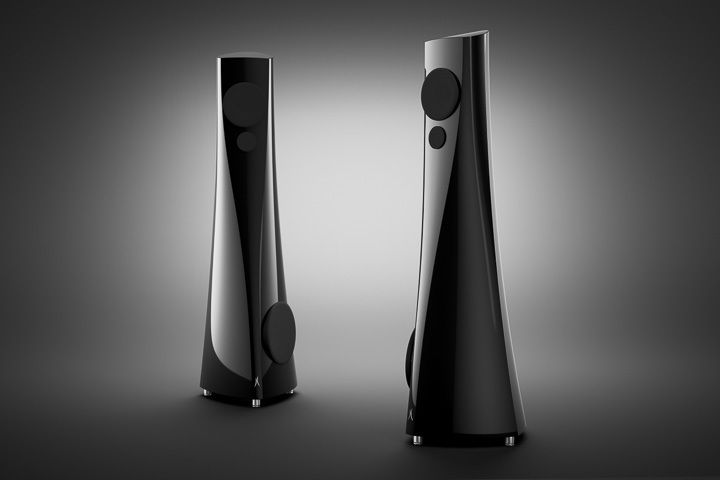 The YB is a fascinating design, made like all Estelon speakers in Tallinn, Estonia and designed by Alfred Vasillkov. The asymmetrical cabinets have little in the way of a straight line as they twist upwards like a giant barley sugar. They change proportion and shape as you view them from different angles. From the side they appear to be leaning forward as they rise. The light catches them and the soft edges appear sculptural as you begin to appreciate their elegant stance and amalgamation of angles. The swollen base accommodates the large inward facing bass units although these drivers are firing at an angle, across the room rather than directly at each other. They are 203mm aluminium-coned designs that can be used with or without a clip on cover. The cabinet snakes its way northwards where, at the summit, you will find a 133mm midrange unit with a sliced paper cone. The sliced sections are filled with glue to damp the cone and dramatically reduce breakup modes within its diaphragm. Just below this sits a 25mm beryllium tweeter. This high mounting negates early reflections from the floor and must go some way toward the YB’s trademark clean, uncluttered sound. All the drivers are made linked to the internal crossover by Kubala-Sosna cabling. There are no ports.